Acer has technically upgraded its 18.4 inch lineup to state-of-the-art. 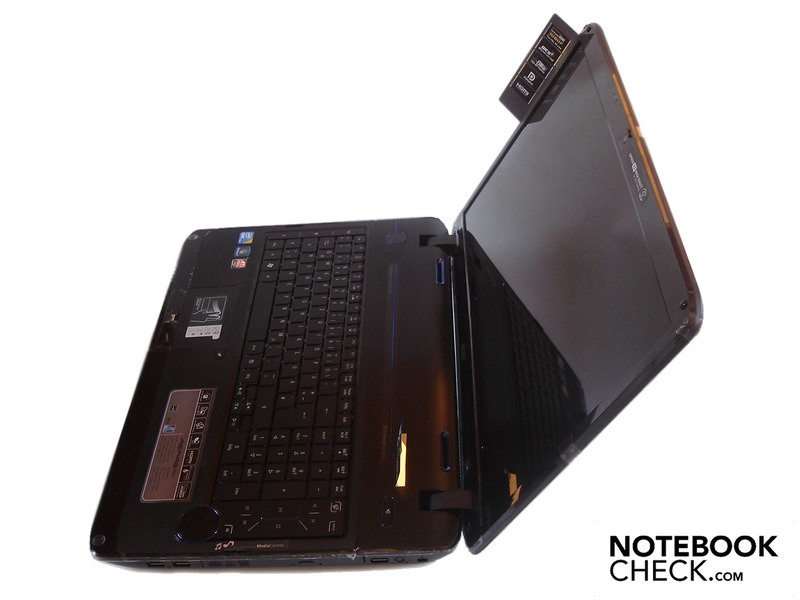 An Intel Core i3-330M and ATI Mobility HD 5640 speak for a good performance. If the Aspire 8942G is thus suitable as a multimedia platform or as a full-fledged desktop replacement can be read in our comprehensive review. The formerly reviewed Aspire 8940G is already a bit older. It has an efficient quad-core CPU with Intel's Core i7-720QM (1.60 GHz, turbo boost up to 2.80 GHz). The graphic card used is "only" an upper middle class model, the Nvidia GeForce GTS 250M, which is often overtaxed with games in the native resolution of 1920x1080. 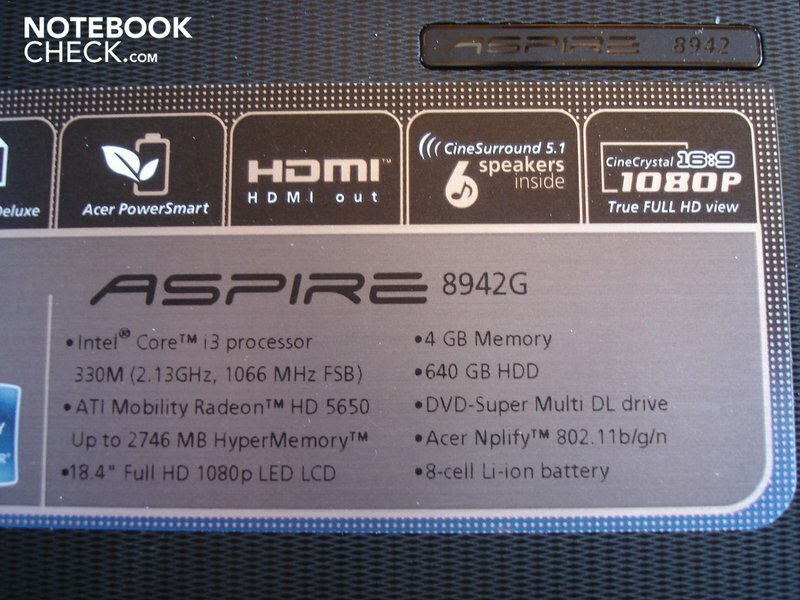 The Aspire 8940G's starting price is around 1300 euro. A more inexpensive model for around 1000 euro exists, as well. But we wouldn't recommend it due to the relatively weak graphic solution (GeForce GT 240M). A few more models are available for more than 1000 euro, which resemble each other more or less (differences in RAM and hard disk capacity). 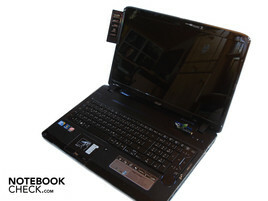 They have a Core i7-720QM quad-core processor and a stronger graphic card, named Radeon HD 5850. Since the Aspire 8942G's case resembles the already reviewed models, 8940G and 8935G, we'll summarize the parts about case, connectivity and input devices short and to the point. The case is made of plastic and is manufactured well. The applied high-gloss surfaces are very sensitive and tend to smudge quickly. The dark blue notebook lid, the white keyboard illumination and the roughened wrist-rest texture provide nice accents. There's not much to complain about in terms of stability, except for the, in some places, instable display lid. The hinges are stable and keep the big display well in position. However, the case swings along evidently at opening despite the good weight of almost 4 kilograms and the display only has a very limited maximum opening angle. The connectivity is generous; you'll find a fitting connection for almost every device. Most connections are found on the left. A righty's pleasure could turn into a problem for lefties. 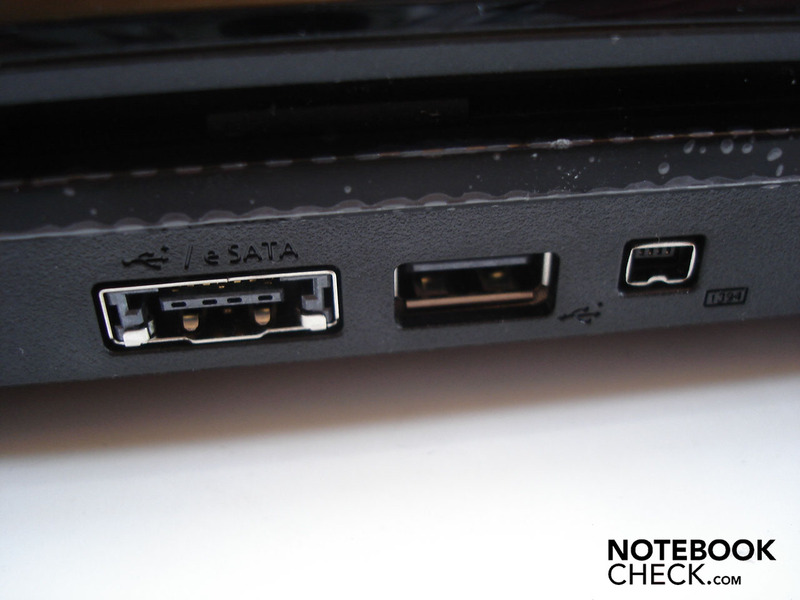 It starts with the DC-in, over the usual suspects, the RJ-45 gigabit LAN and VGA. 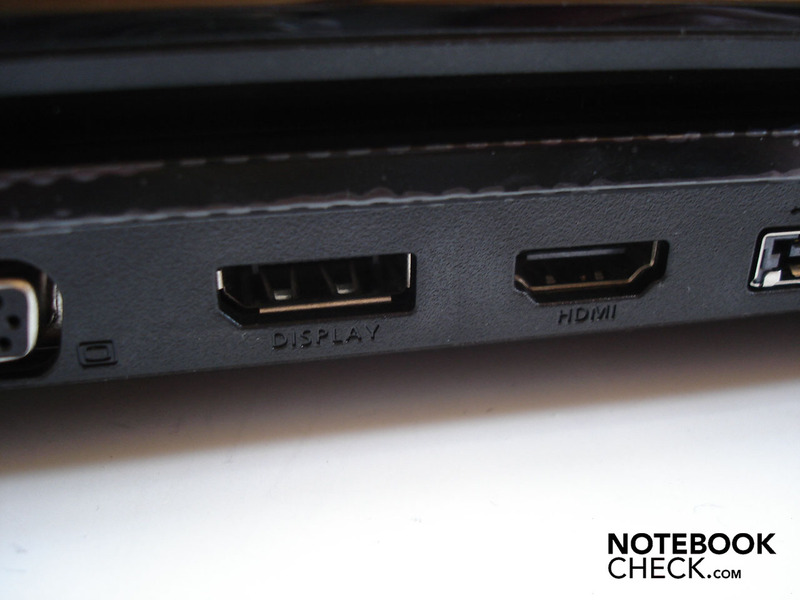 You'll receive a better image quality over the following display port and HDMI connection. An eSATA/USB combo, a USB 2.0 and a FireWire port have been placed beside these. 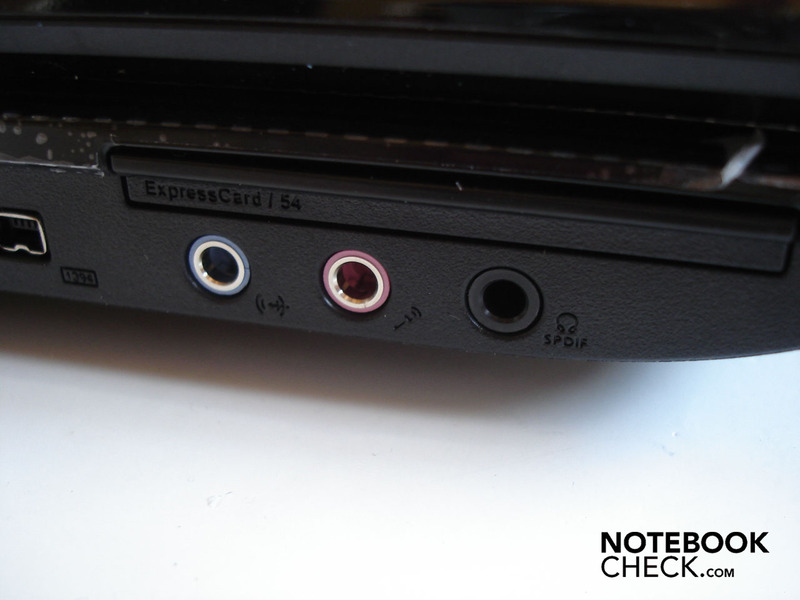 Three audio sockets (line-in, microphone, headphone + S/PDIF) and a 54mm ExpressCard slot conclude the side. 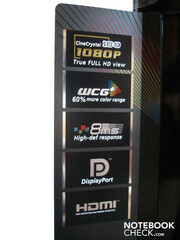 An infra-red receiver for remote controls and a 5-in-1 cardreader that can read SD, MMC, XD, MS and MS Pro are on the front. 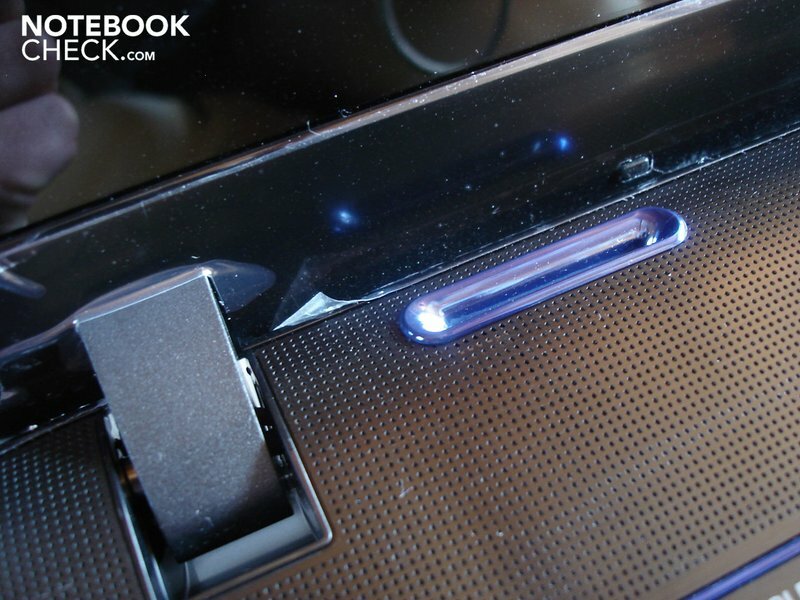 Finally, the right has a normal DVD burner, three further USB 2.0 ports (whereas they have been positioned too far front for our taste) and a Kensington lock. 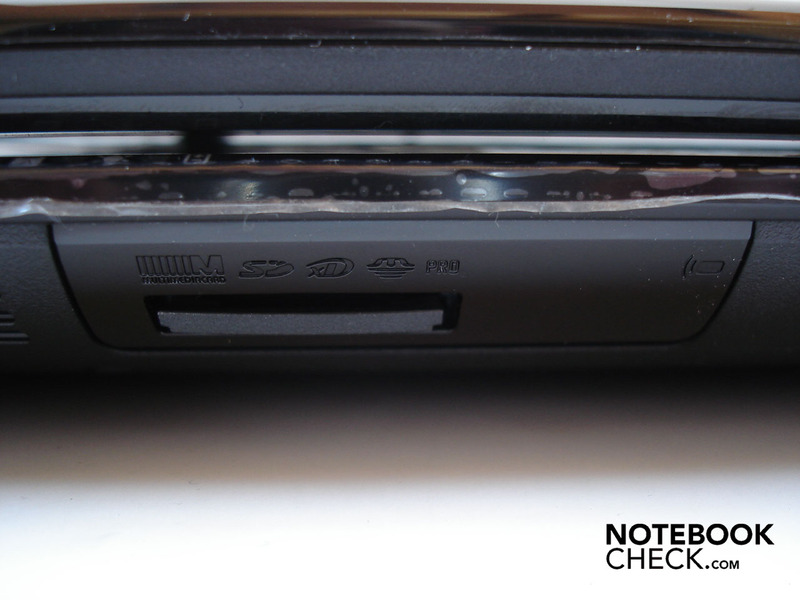 The package is rounded off with WLAN and Bluetooth on the wireless side. 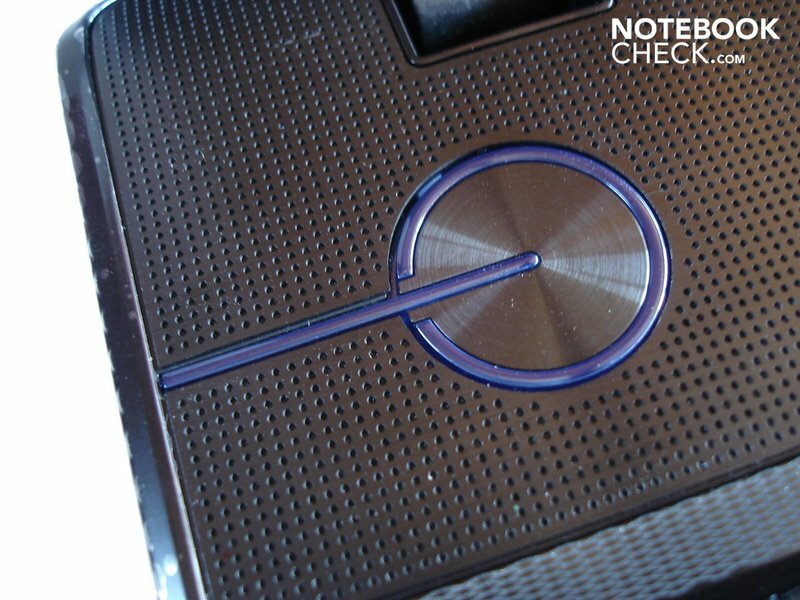 Otherwise, the Aspire 8942G also has a 1 megapixel webcam and a fingerprint reader. As usual, Acer has stuffed the system with dozens of (usually completely superfluous) software. First, when you take the time or trouble to deinstall the whole ballast, you'll be rewarded with a very fast system. 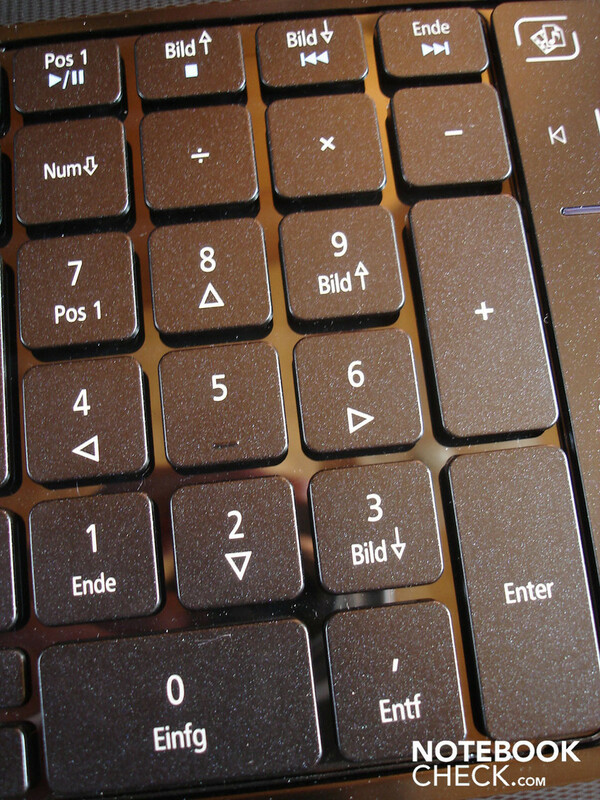 The keyboard is still pleasant to use even after several hours of use. 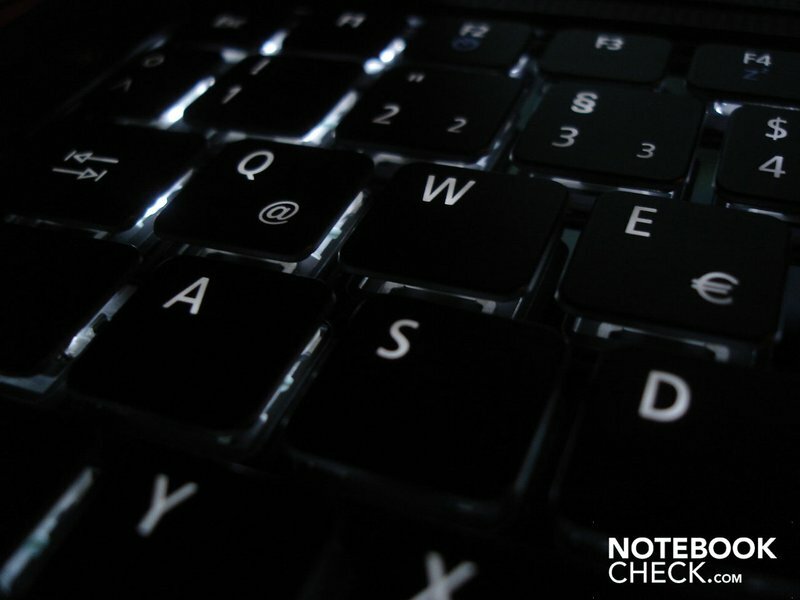 Typing is very agreeable due to the short stroke length and the precise stroke. Because Acer uses a good layout, the keys have a good size and the Aspire 8942G can serve with a numerical block, you quickly get used to it. 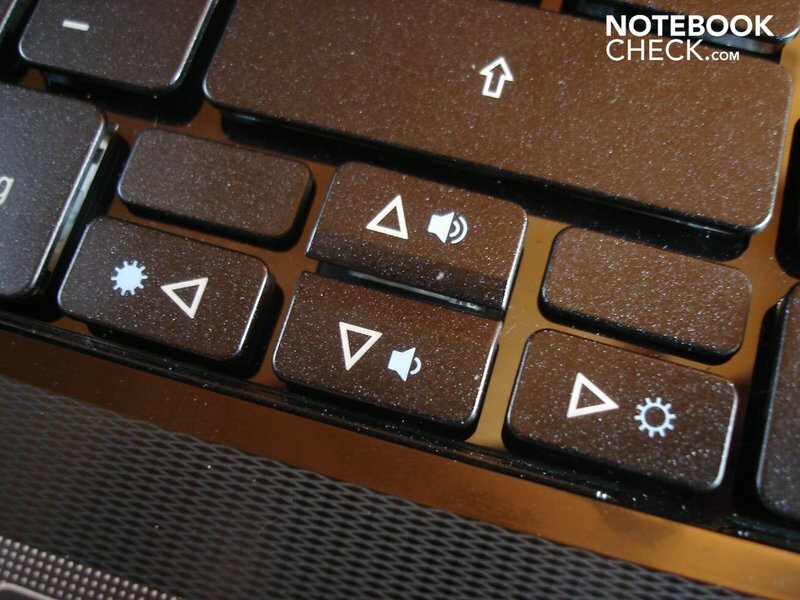 Furthermore, the white keyboard illumination provides a perfect orientation even in complete darkness. 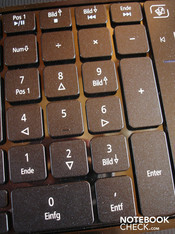 But there are two flaws: thus, both the arrow keys, as well as the left shift key have turned out much too small. 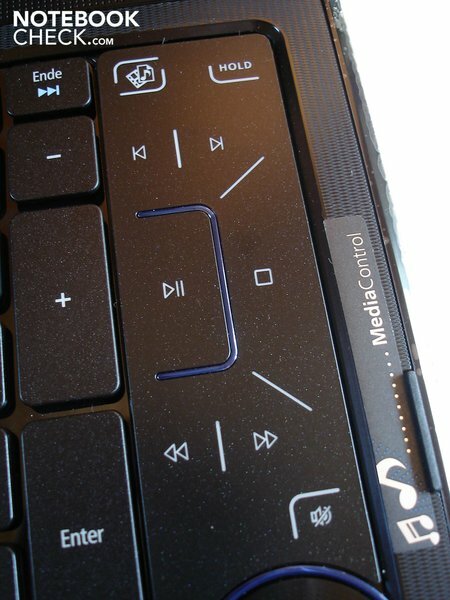 A highlight of the control element is the very handy multimedia control on the keyboard's right. The oversized volume dial is definitely the eye-catcher. 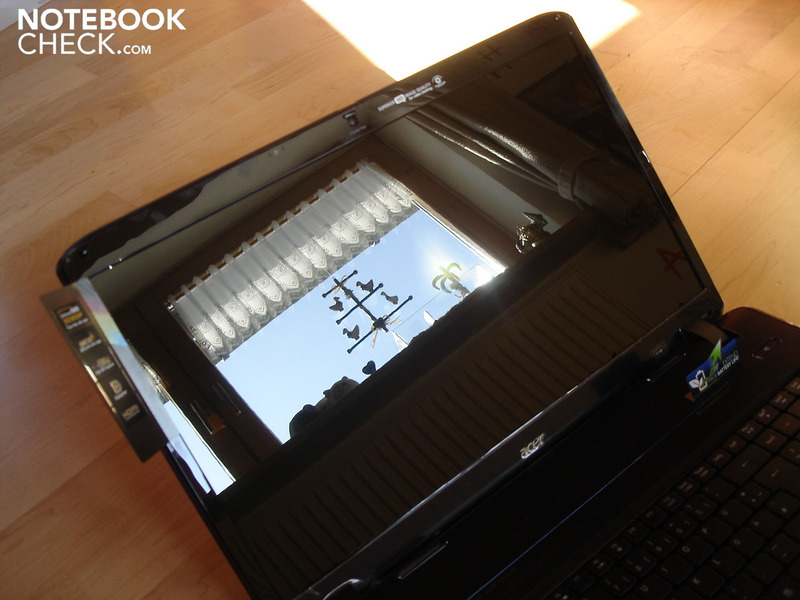 Acer has placed the touchpad too far left but it is convincing in its size. Because of the quite smooth surface, good gliding traits are guaranteed. In return, the scroll function and the supported gestures prove to sometimes be finicky. 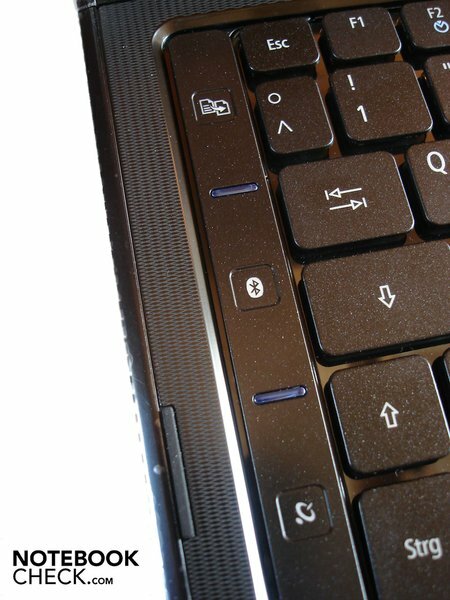 Both mouse keys underneath the touchpad are alright in terms of pressure point and acoustic feedback, but they could be better. Whilst the Aspire 8940G's 18.4 inch FullHD display didn't exactly provide for feelings of rapture due to a meager brightness of 155.5 cd/m2 and a disappointing illumination of 67%, the Aspire 8942G's display turns out far better, even if top rates aren't achieved once again. Thus, the contrast of 189:1 and the black value of 1.06 cd/m2 can at most be described as adequate. The average brightness of 195 cd/m2 is a bit better than the predecessor's, but the illumination has improved considerably with 86%. All in all, the given display quality isn't really good, but not a complete failure. Subjectively, the colors appear fairly natural and saturated and the image is sufficiently bright and contrast rich. Only the not really optimal black value leaves us with a sour taste, especially in dark scenes. 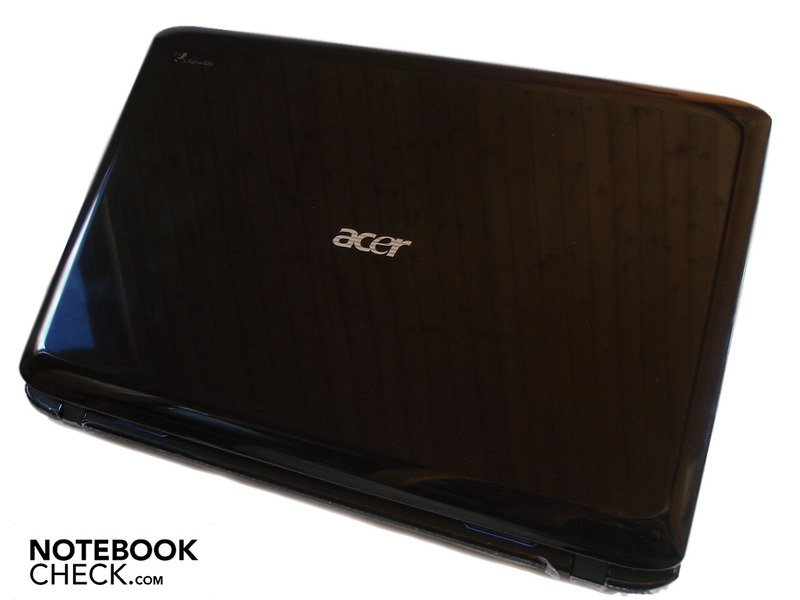 As in actually all currently available DTR/multimedia notebooks, Acer hasn't forgone on a glossy coat for the display. The image might seem to be more vivid, but unpleasant reflections turn up - sometimes even indoors. So, you should really carefully consider your location or rather the positioning in the room. To carry the 18.4 inch bolide outdoors isn't a good idea because you'll barely recognize anything on the screen in bright daylight. A further problem of the display is the limited viewing angles. They may still be excusable to an extent on the horizontal plane, but annoyance quickly turns up on the vertical plane. If you only tilt a bit, the image turns quite gray immediately. What you might be able to live with at work will turn out to be disagreeable for gaming or movies, at the very latest. 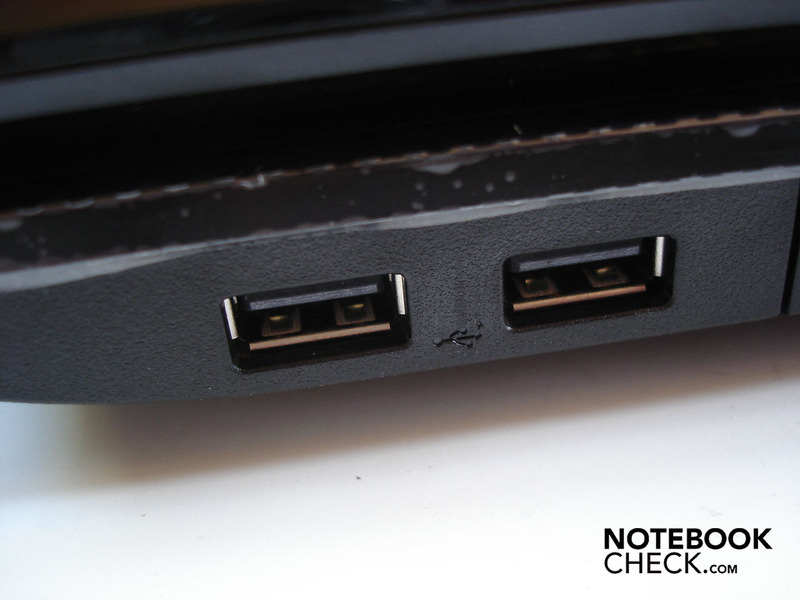 Acer has exclusively used components of the middle class for the Aspire 8492G. The CPU comes from Intel's newest development stage and has been named Core i3-330M. 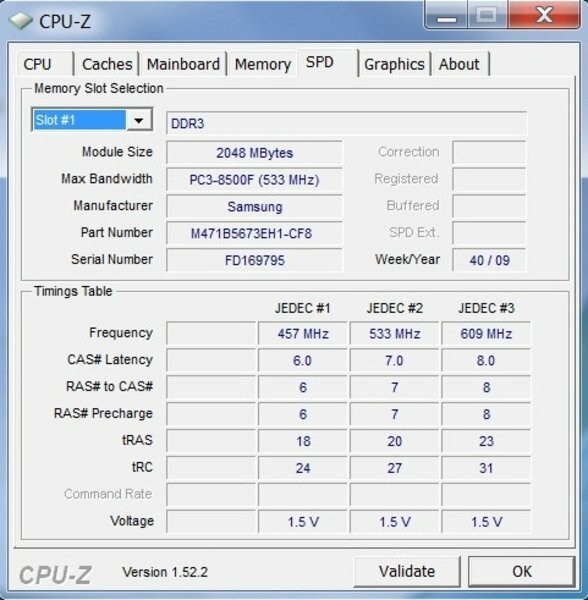 The i3-330M is a two core processor with a clock rate of 2.13 GHz. In opposition to Core i5 and Core i7, it doesn't have turbo boost, so the practical turbo mode that provides for an automatic overclocking. This is in so much a pity, as many new games first really run smooth at about 2.40 GHz. 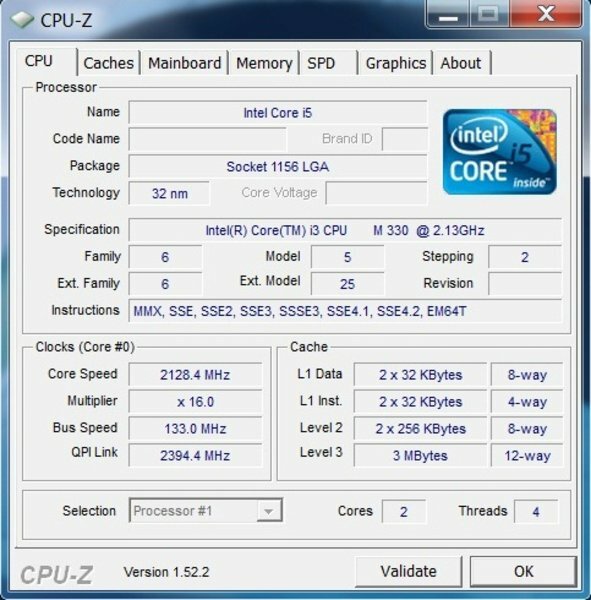 At least the i3-330M has the hyperthreading technology that simulates two additional CPU cores. The advantage of this is still limited in games, but certain applications already have benefit largely from this function. The power consumption is in the upper middle field and is still okay with 35 watts because the i3-330M has an integrated graphic chip, named GMA HD. In opposition to the processor chip, it isn't manufactured in 32nm but in the somewhat older 45nm process. 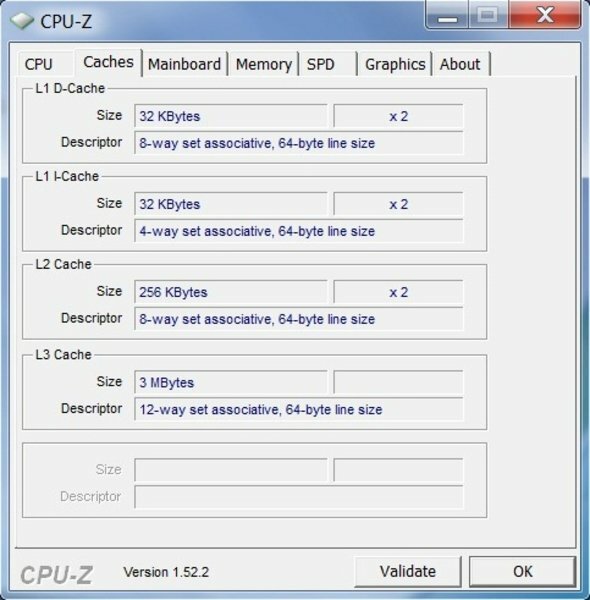 Furthermore, the i3-330M serves with a 512 KByte L3 cache and even a 3 MByte L3 cache. 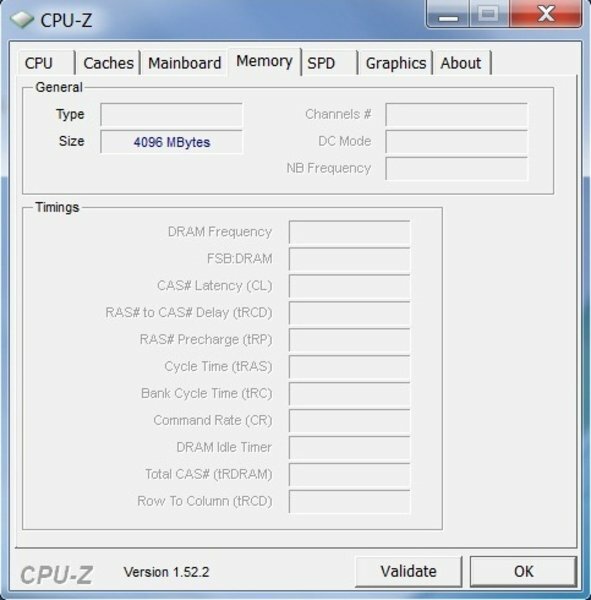 The meanwhile usual 4 GByte (2x 2048 MBytes) DDR3 RAM, which can also be used completely due to the 64 bit operating system (Windows 7 Home Premium), supports the processor. 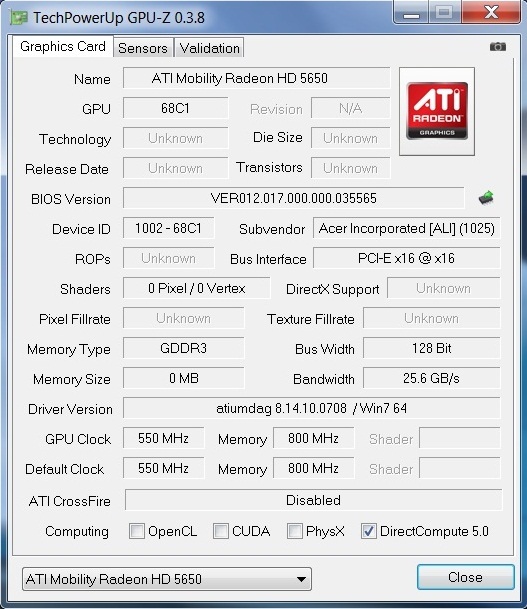 Acer relies on the brand new, and finally available in larger quantities, Mobility Radeon HD 5650 from ATI as the graphic card. The HD 5650 is the successor of the favored, as well as very convincing in terms of value for money, HD 4650 and now supports the logical evolution step, DirectX 11 and not only DirectX 10.1, as did its predecessor. The manufacturing process has decreased by 15nm to a cutting edge 40nm. Too bad that the 128bit width hasn't changed and thus the extremely small memory interface turns into a bottleneck with the used DDR3 video memory. Modern games crave for at least a 256 MByte memory link to a DDR3 VRAM. If a 128 bit wide memory interface is used at all, then a fast GDDR5 VRAM (significantly higher band width) should be used as a video memory in any case, so that an unnecessary performance loss is prevented. As we've already seen in the Toshiba Qosmio X500's review, the performance difference between a GDDR3 and a GDDR5 is averagely about 20%. Short: 128 bit memory interface plus (G) DDR3 VRAM has simply become antiquated in the meantime. This way, the Radeon HD 5650 can a) only partly distinguish itself from its predecessors HD/4650/4670 and b) barely benefit from its actually opulent 1024 MByte sized memory. 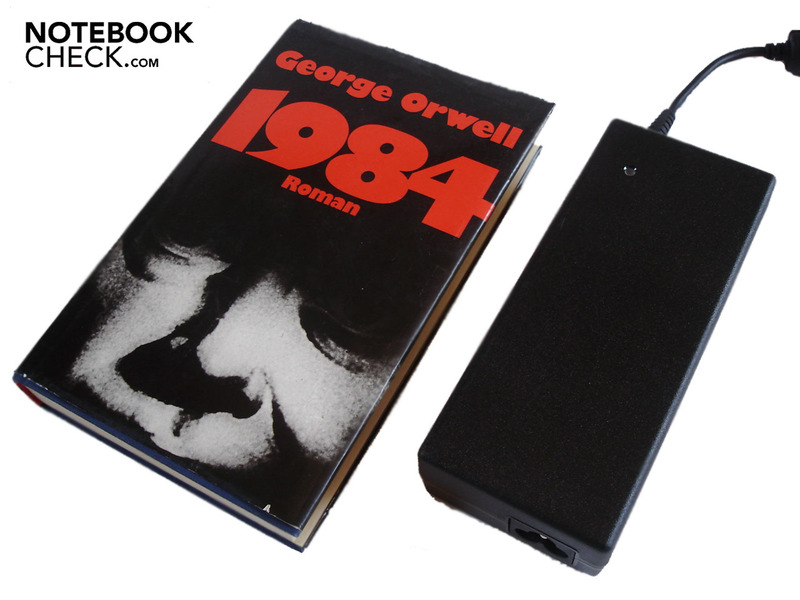 You can consider the fairly low power consumption of 15-19 watts as a small reimbursement. 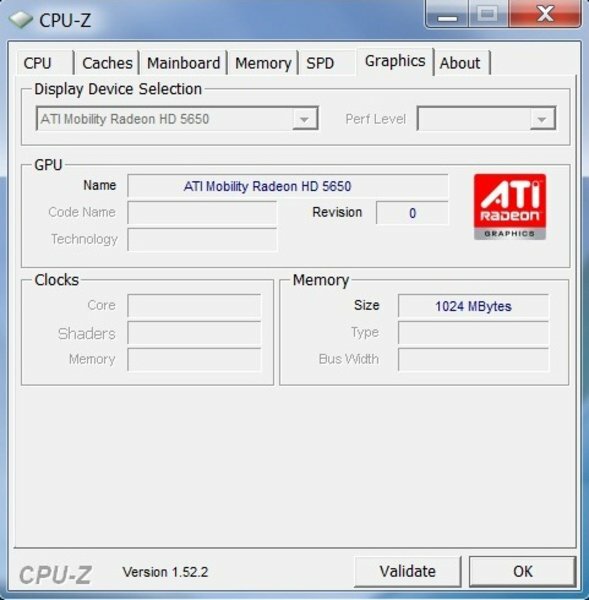 By the way, the Radeon HD 5650's, built into the Aspire 8942G, clock rate is 550 MHz (core) and 800 MHz (memory). Further features of the HD 5650 are Eyevision (use of up to 6 monitors simultaneously), HD Audio via HDMI (8 channel Dolby True HD, DTS) and UVD2, which supports the CPU in computing high resolution videos. Unsurprisingly, the Core i3-330M's application performance settles in the center field according to our synthetic benchmarks. For example, it's enough for 4755 points in PCMark Vantage, and 2911 points in the single-core and 6709 points in the multi-core rendering of Cinebench R10 (64 bit). 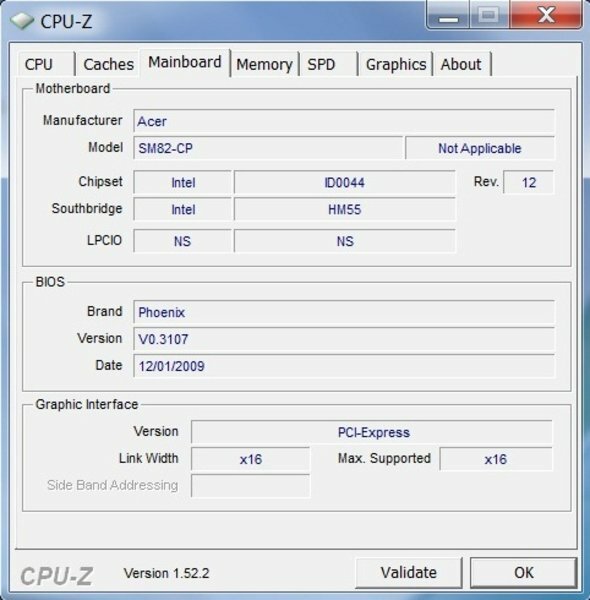 In comparison, a high-end CPU, such as the often applied Core i7-720QM, achieves about 3667 points in single-core and 10020 points in multi-core. The Radeon HD 5650's performance in the graphic-biased 3DMarks halves itself continuously with every used version. Whilst 12872 points are reached in 3DMark05, it's still 6540 points in 3DMark06 and finally 3150 points in 3DMark Vantage. The GeForce GTS 250M is quite a bit faster in 3DMark Vantage with 3848 points, the Radeon HD 4650 is noticeably slower with 2456 points. The hard disk comes from Western Digital and has a generous capacity of 640 GByte. 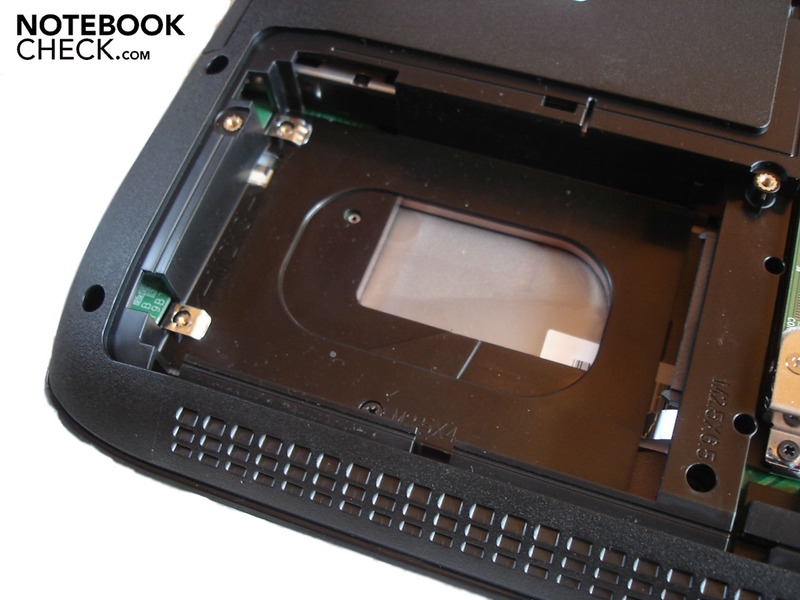 Because a further (easily accessible) hard disk slot is concealed in the case, the capacity can easily be increased to one TByte in the future. 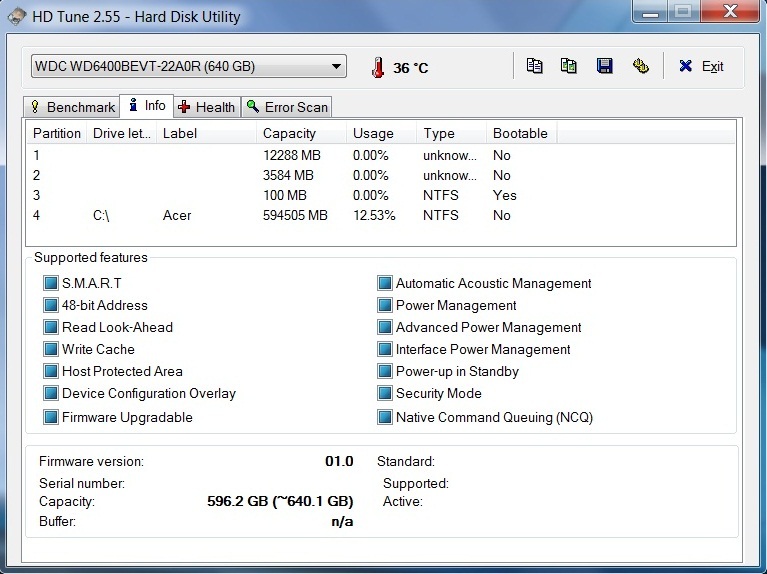 The already built-in hard disk runs with 5400 rpm and only has one single partition - impractical. The access rate (18.3 ms) and throughput rate (79.5 MB/s) are inconspicuous. The transfer rate of averagely 62.2 MB/s is good and somewhat better than a majority of notebooks. 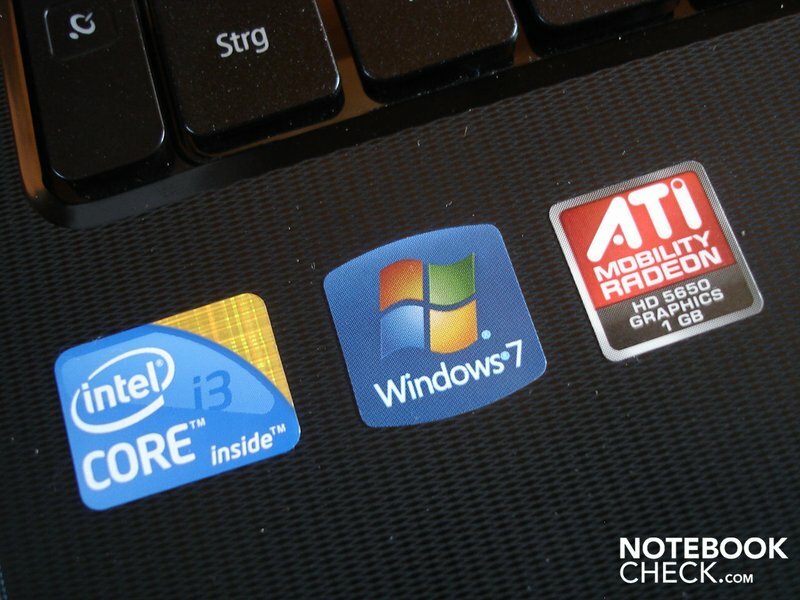 That Acer has chosen the components balanced and with care is shown in Windows 7's performance index, as the best and the worst rates only have a difference of 0.8 points. 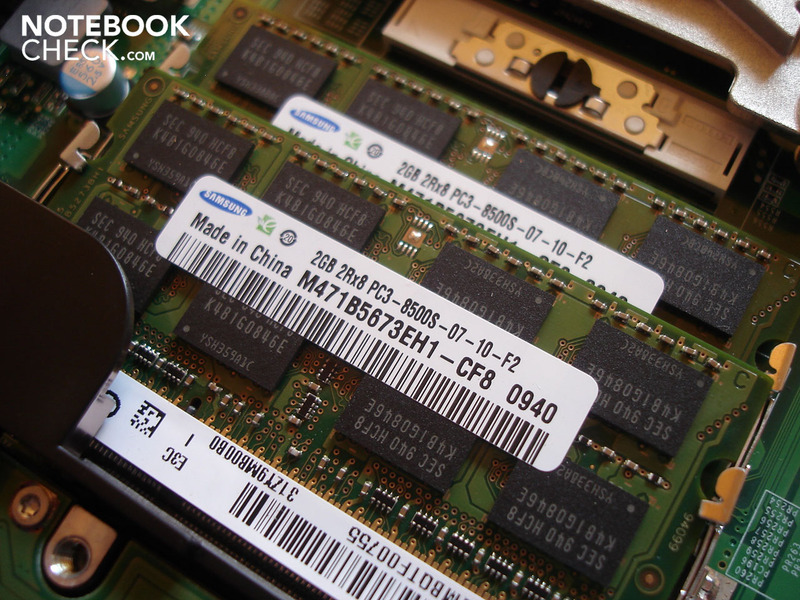 Starting with the RAM and hard disk that score 5.9 points. Further with the processor that has been rewarded with 6.2 points. Up to the graphic card that concludes with 6.7 points. 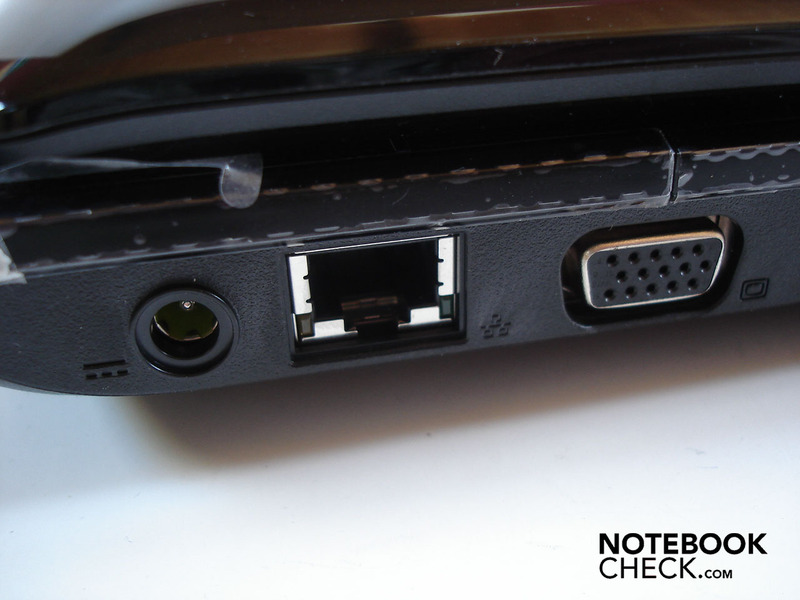 If you are planning to connect external devices, such as sound cards, to the Aspire 8942G, you might have bad luck. 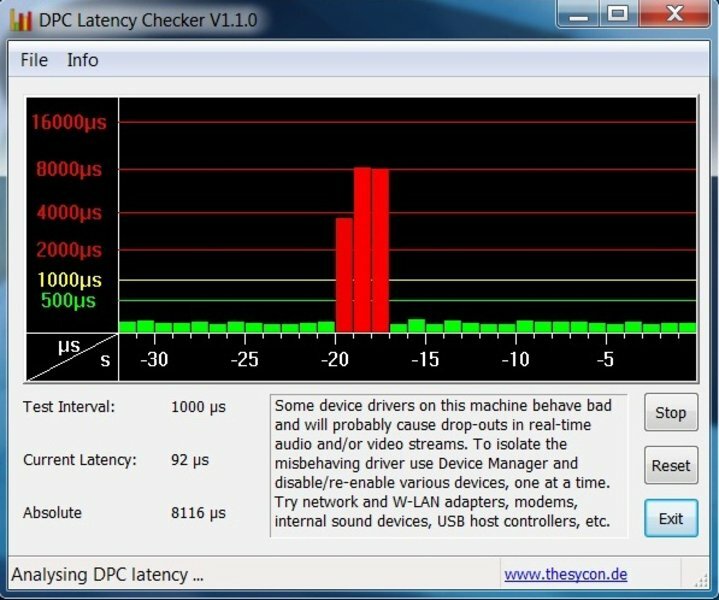 According to the DPC Latency Checker tool, the latencies rocketed to a high 8000 µs every now and again in our tests. Too high latencies can lead to transmission errors, e.g. in sound cards a sound crackling could turn up. In the heat of the moment, we weren't able to establish which driver is ultimately responsible. The Aspire 8942's application performance is all in all good. No matter if multitasking or multimedia, the given performance is always more than sufficient. Bombastic staging has always been one of the Call of Duty series' hallmarks. The sixth part also lives up to this. However, the Radeon HD 5650 has a lot to chew in the native resolution of 1920x1080, very high details and 4xAA and only achieves 24 fps. The predecessor, Radeon HD 4650, is considerably slower with 16 fps; the mentioned GeForce GTS 250M built into the Aspire 8940G is a bit faster with 28 fps. If the details are reduced to a high level and you forgo on the performance sapping anti-aliasing, a well playable 35 fps are possible on the Aspire 8942G. After the rather arcade-biased forerunner, Need for Speed goes a much more realistic way with Shift. 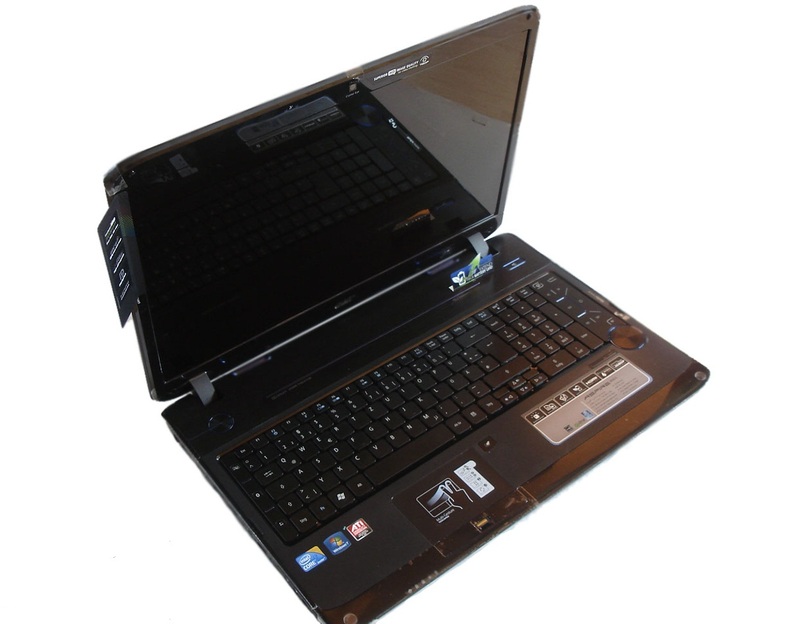 In comparison to its forerunners, the hardware requirements have increased considerably. So, you can't exactly speak of a fun race experience in high details and the FullHD resolution with 25 fps. You can first race over the circuit agreeably with 29 fps in medium details. Objectively, Risen can't quite keep up with the quality of the role game heavy weight of 2009, Dragon Age, but it does supply for many fun hours with its authentic game world. The Aspire 8942G's performance doesn't supply so much fun. As already seen in other graphic cards with a 128 bit wide (G) DDR3 memory interface (as the GeForce GTS 250M), the HD 5650 can't really take a shot at Risen. Risen jolts along unplayable with 17 fps in a resolution of 1920x1080 and high details. The German role game doesn't run much smoother even in medium details with 21 fps. The no longer fresh horror shooter, F.E.A.R. 2 pairs good looks with a good performance. In our standard resolution of 1280x1024, high details and 4xAA, F.E.A.R. 2 slithers as smooth as silk over the screen with around 42 fps, theoretically. 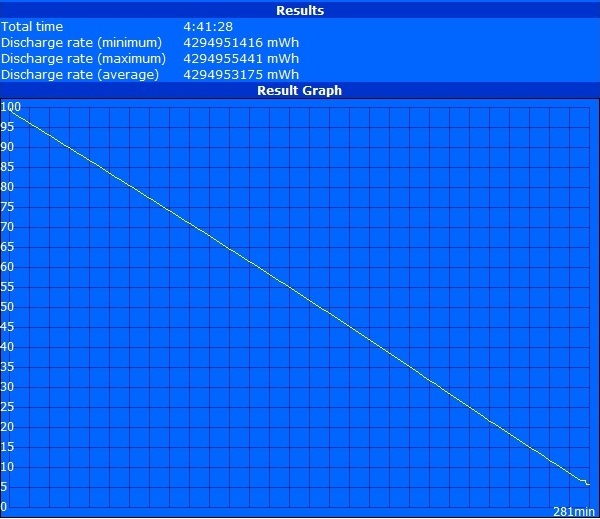 Practically, the game often pauses completely for fractions of a second. That's not very nice, however we have observed this situation in other notebooks (so the game might be responsible). Because of this error, the HD 5650 lines itself underneath the GeForce GTS 250M (45 fps) and even under the Radeon HD 4650 (44 fps). F.E.A.R. 2 could only henceforth be played with restrictions in the FullHD resolution and high details with 25 fps. Anno 1404 is treated to the long sought for multiplayer mode with the add-on, Venice. In the meantime, we'll fall back on the main game. The building strategy game proves to have an adequate performance with around 26 fps in a resolution of 1920x1080, high details and 2xAF. The average refresh rate was hardly more with 27 fps in a resolution of 1280x1024, very high details and 4xAF. The GeForce GTS 250M is just as fast with 27 fps, the Radeon HD 4850 lags behind a bit with 21 fps. The HD 5650's performance in the DirectX10 benchmark demo of FarCry 2 is impressive in high details, at least in a resolution of 1024x768: 44 fps are more than enough for a smooth image buildup. If you increase the resolution to 1920x1080 though, the performance collapsed accordingly by almost the half: a mediocre 25 fps is the result. In return, medium details run smoothly in the native resolution. The tech-heavy shooter represents the second and significantly more demanding DirectX 10 benchmark. Thus, it's already too much for the Aspire 8942G in high details in a low resolution of 1024x786. In the end, a meager 23 fps for the CPU and 27 fps for the GPU runthrough is recorded. The Radeon HD 4650 and GeForce GTS 250M are (but for a difference of 1-2 fps) equally fast. We only demanded medium details in the FullHD resolution from the Aspire 8942G in the first place, but Crysis partly jolted along extremely with 23 fps in the CPU and 26 fps in the GPU runthrough even then. Undoubtedly, the wickedly beautiful Dirt 2 currently sets the standard of good looks in race games. Because the Radeon HD 5640 is capable of DirectX 11, Dirt 2 looks even a bit better than on the DirectX 10 competitor. The reverse side is the considerable resource consumption. Actually, you can finish the race right after the start in the resolution of 1920x1080, very high details and 2xAA because of 14 fps. 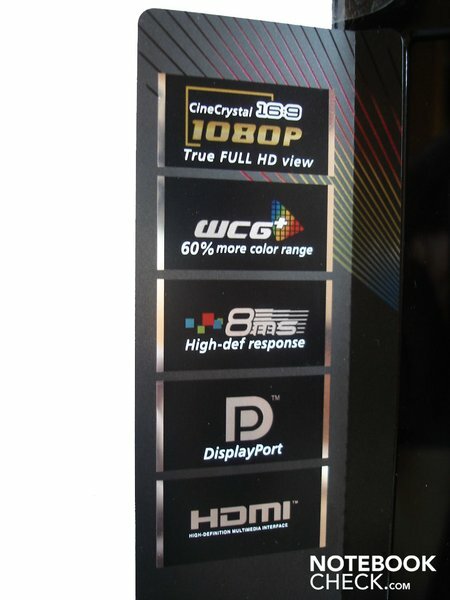 First medium details can provide for a reasonable gaming environment with 30 fps. The Radeon HD 5650 together with a middle class CPU, like the built-in Core i3-330M, basically provides for a good gaming performance. However, this only applies to medium resolution in the field of 1366x768. The HD 5650 often proves to be overburdened in newer and/or more demanding games in higher resolutions, as in the case of the Aspire 8942G. Thus, numerous tracks like F.E.A.R. 2, Dirt 2, Shift and FarCry 2 only run playable in the native resolution in medium details. For extreme examples, such as Crysis, not only the details but also the resolution have to be reduced. The HD 5650 can only distinguish itself from its predecessor, the Radeon HD 4650, to a part. 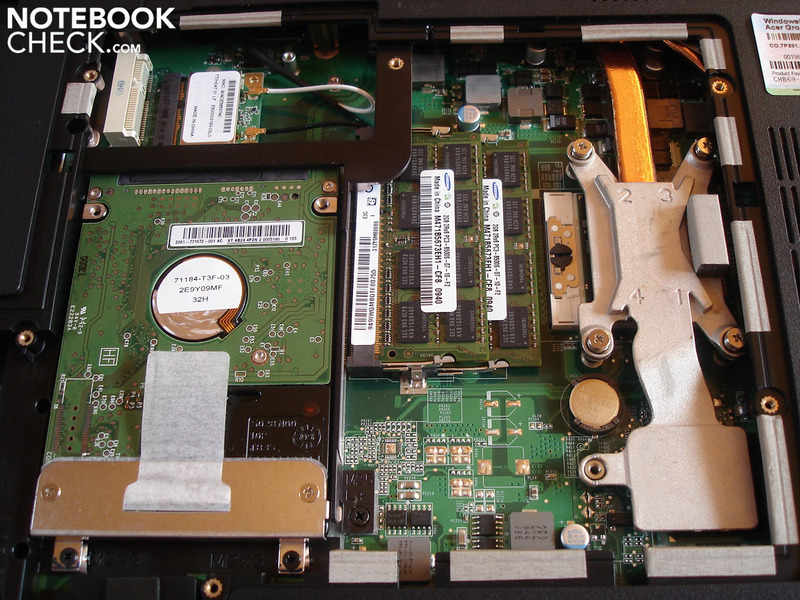 The GeForce GTS 250M built into the Aspire 8940G is more or less on the same level in our case. 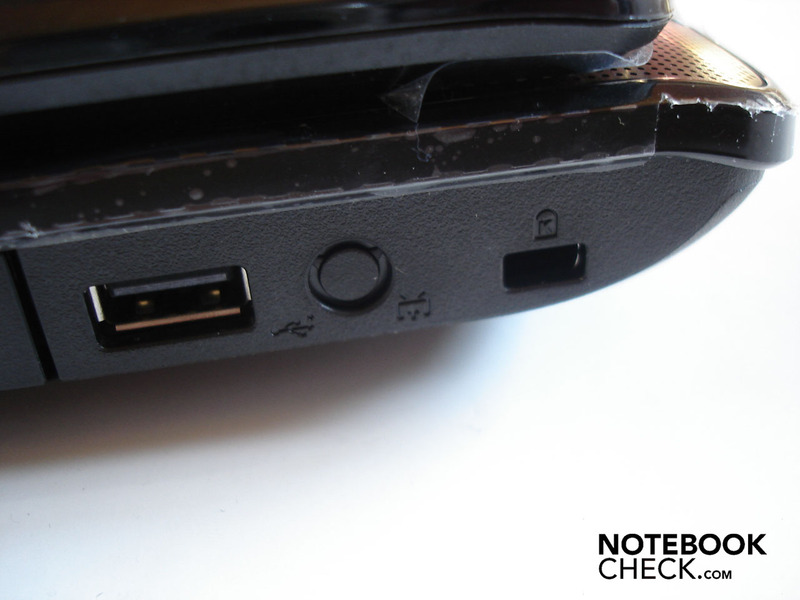 Demanding gamers should basically avoid big shot notebooks with an HD 5650. In return, the given performance should satisfy average gamers, who don't need to always play the newest tracks in the highest details. A big advantage of the Aspire 8942G is its fairly quiet noise development. 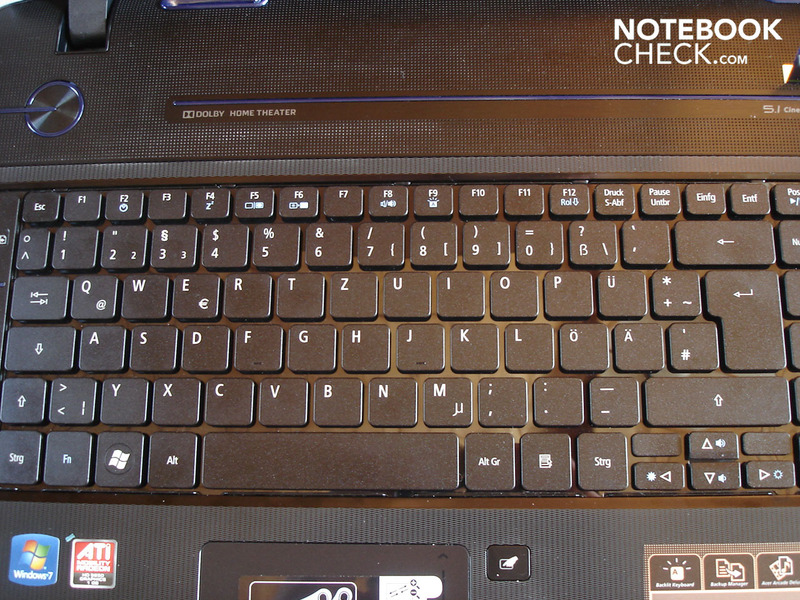 The notebook is slightly audible in idle mode with 32.5-33.1 dB(A) but quiet anyway. The hard disk is almost drowned by the fan noise, with its 33.1 dB(A). The volume increases to a higher, but neither disagreeable nor annoying level of 34.0-34.1 dB(A) under load. 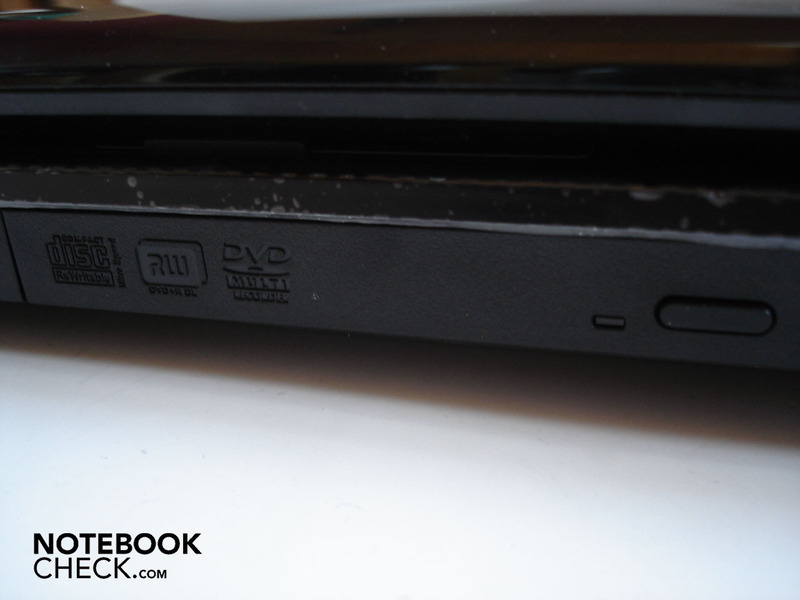 The optical drive is still most noticeable when DVDs are rendered with 35.0 dB(A). However, the drive turns up evidently at data access and annoys with an unpleasant noise level. Also annoying: The built-in case fan is, as mentioned, fairly quiet but it doesn't always run smoothly and emits a slight rattling noise instead. This slight rattling is only really noticeable when an ear is put close to the case. And anyway, the prototype could be an exception. 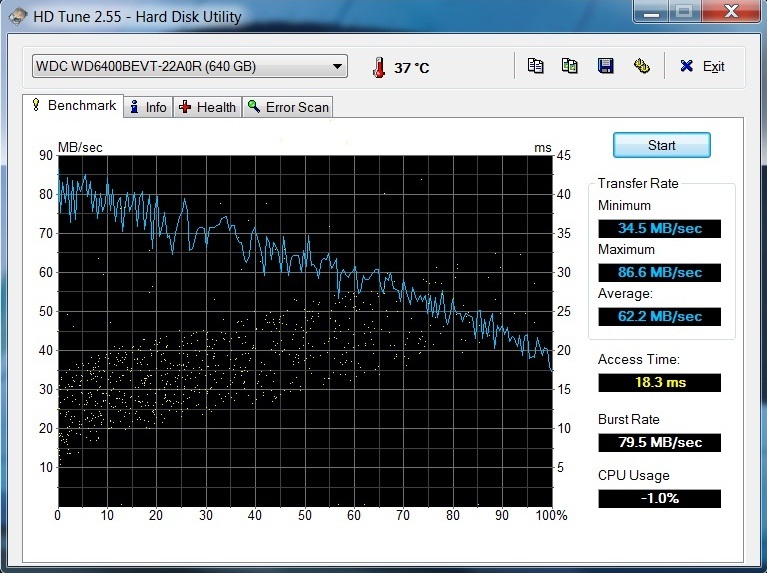 In comparison: The Aspire 8940G model turns up a lot more under load with 45.4 dB(A). Not only can the noise level distinguish itself pleasantly from its competitors, but also the surface temperatures. Both the bottom, with a maximum of 22.1 °C, as well as the upper side, with a maximum of 23.6°C, remain pleasantly cool in idle mode. The bottom barely gets warmer under load with only 26.0°C. You can put the 8942G on your lap without hesitation - that is as long as the heavy weight doesn't bother you. The upper side sometimes heats up partly to 31.2°C under load (left wrist-rest area). 31.2°C indicates a slight, but not unpleasant, heating of the palms. The Aspire 8940G gets a lot hotter in our test with a maximum of 41.1°C on the bottom and a maximum of 42.0°C on the upper side. (+) The average temperature for the upper side under maximal load is 26.9 °C / 80 F, compared to the average of 32.9 °C / 91 F for the devices in the class Gaming. (+) The maximum temperature on the upper side is 31.2 °C / 88 F, compared to the average of 39.3 °C / 103 F, ranging from 21.6 to 68.8 °C for the class Gaming. 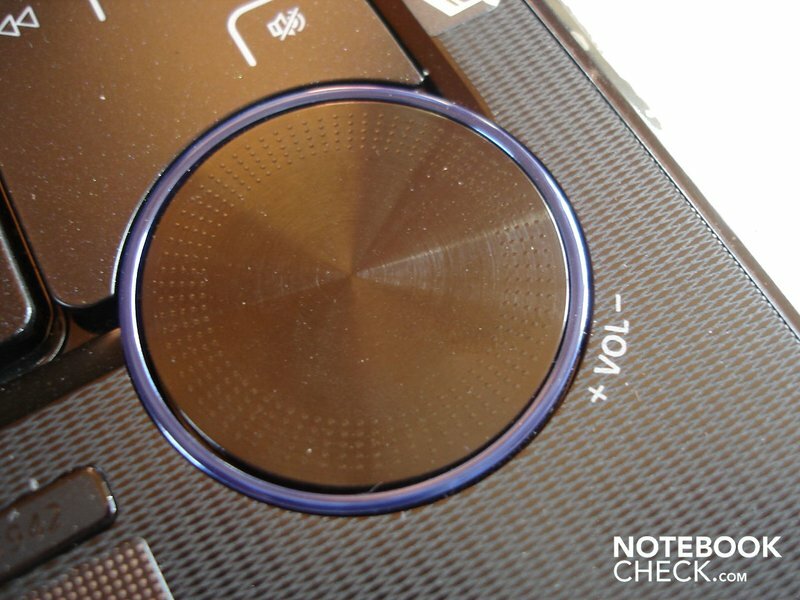 (+) In idle usage, the average temperature for the upper side is 22.4 °C / 72 F, compared to the device average of 32.9 °C / 91 F.
Most notebooks are very inadequate when it comes to the sound quality of the built-in loudspeakers. The Aspire 8942G doesn't have to take much reproach in this regard because the built-in 5.1 system, including the subwoofer, called Tuba, is capable of providing for an over average soundscape. Therefore, the given maximum volume is more than sufficient on the one hand (even if the sound can fray if you exaggerate). On the other, every pitch range appears to have a fairly balanced mix (even if somewhat treble-prone) and the sound makes a fairly clear and precise impression in comparison to other notebooks. 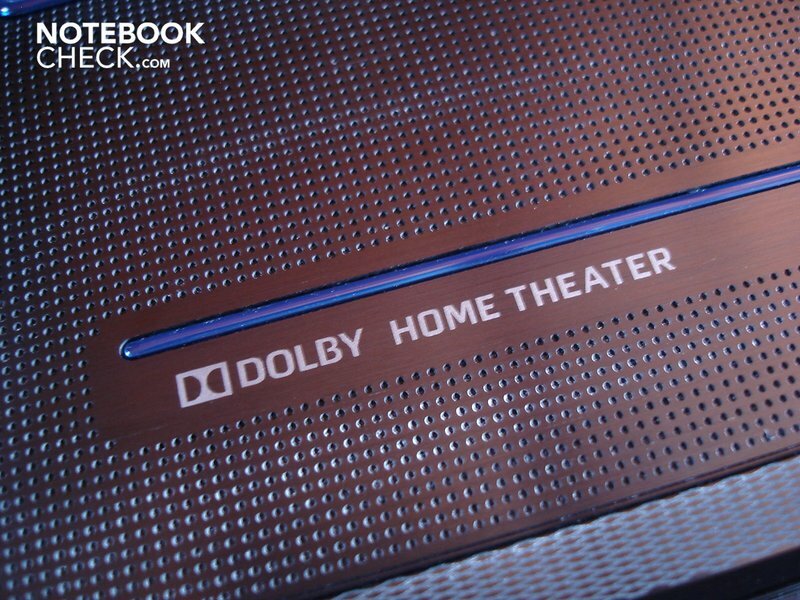 Thus, the sound system, which can serve with support for Dolby Home Theater, is equally suitable for music, movies and games. But there are a few complaints. Starting with the bass, which is existent but a bit flat and faint in its appearance. It still lacks volume and poise. Generally, a surround feeling also just doesn't really turn up. Because we liked the sound without surround sound anyway (under "Dolby" in the loudspeaker "options"; "instant mode" should be enabled by "amplifier"), we'd recommend to disable this option in the first place. Finally, the built-in combination definitely draws the short straw in comparison to full-fledged external sound systems and in our opinion, also can't hold a candle to wide-range loudspeakers of some Toshiba models, like the Qosmio X500. 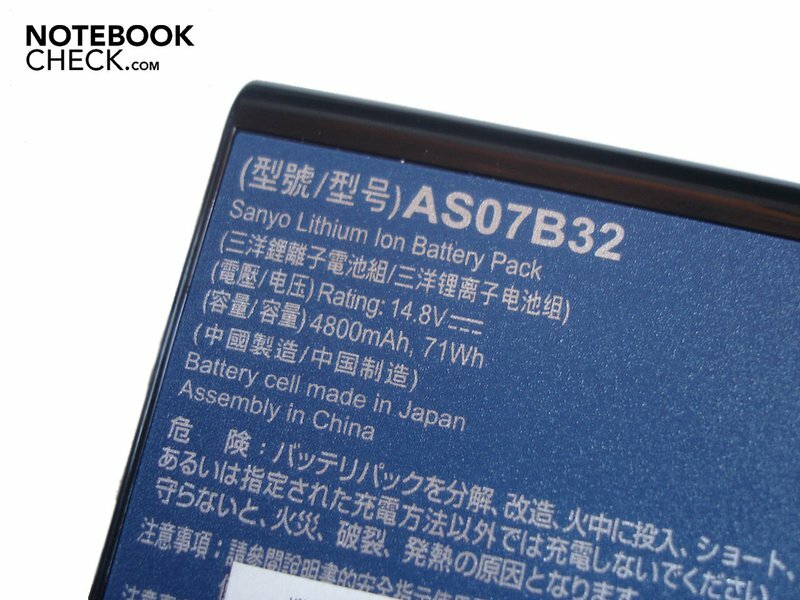 The battery life of the included 8 cell battery (71 Wh) leaves us with mixed feelings in the test. Thus, the Aspire 8942G is already drained after a short 1 hour and 12 minutes under full load with maximum brightness (energy savings options disabled). So playing remote from the mains isn't such a great idea. In return, it's enough for 2 hours and 3 minutes of DVD rendering with maximum brightness (medium energy savings settings). That might be sufficient for a majority of movies, but it literally looks sinister for longer movies. 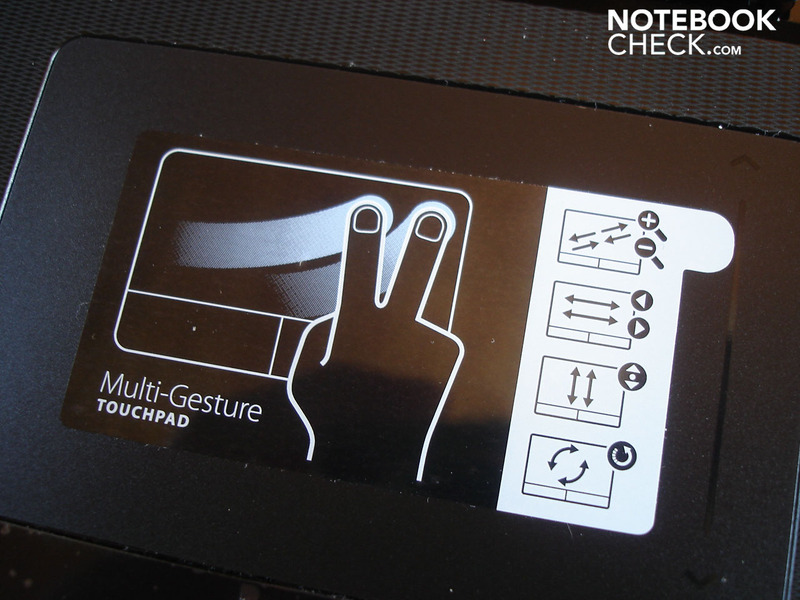 Personally, it's a bit too little for a multimedia notebook. In opposition, the possible runtime rockets under low load. So around 2 hours and 50 minutes can be achieved when surfing in the internet via the integrated WLAN with maximum brightness. It's even a passable 4 hours and 41 minutes in idle mode with minimum brightness (energy savings options disabled). 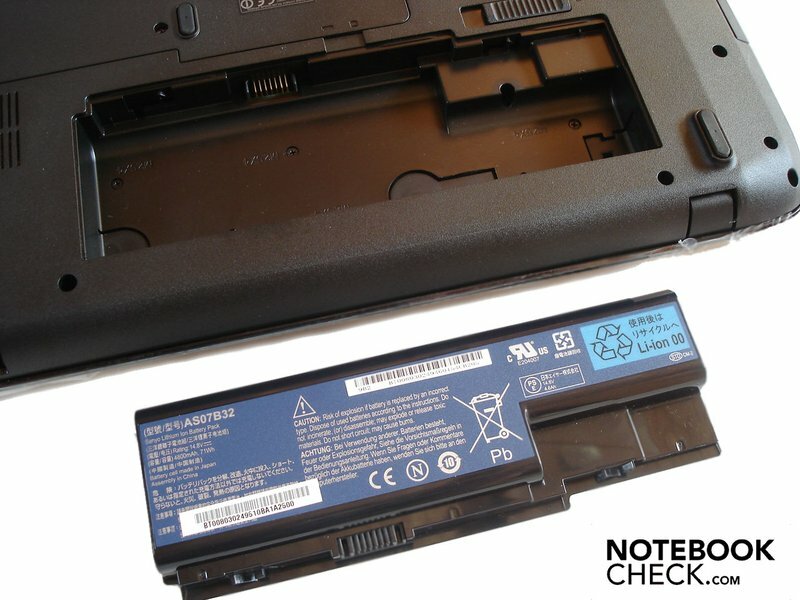 The Aspire 8940G has the same battery but the battery life is between 10 minutes (load) and one hour (idle) shorter due to the less thrifty components (see below). 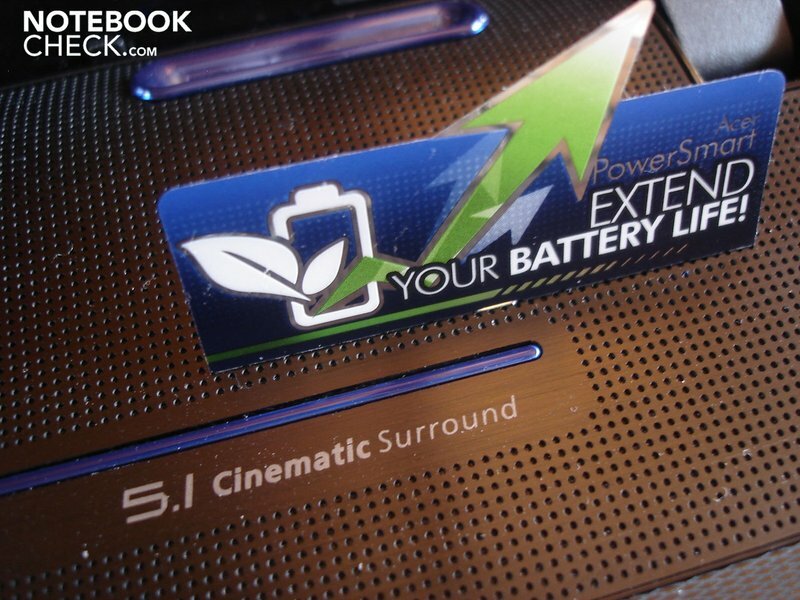 Intel's Core i3, together with the Radeon HD 5650, consumes a moderate amount of electricity. 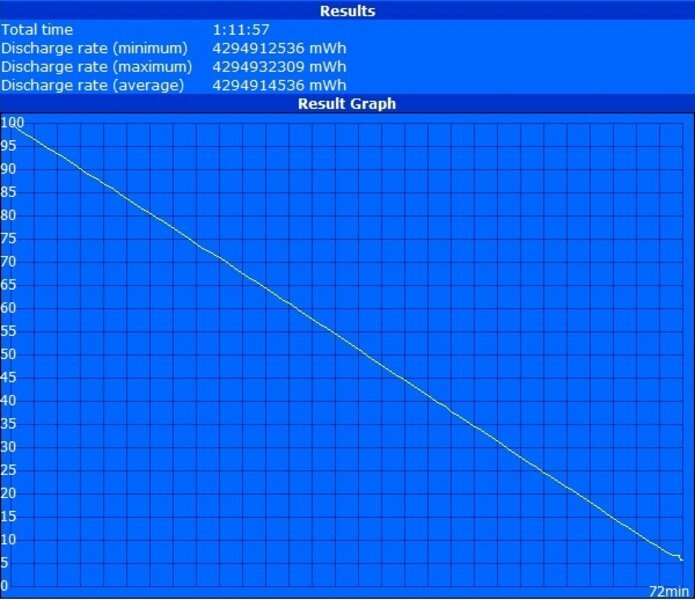 Whilst the consumption in idle mode is around 17.3-23.1 watts, it's 54.2-56.-7 watts under load. The Aspire 8940G partly drains almost twice as much with up to 100.5 watts under load. 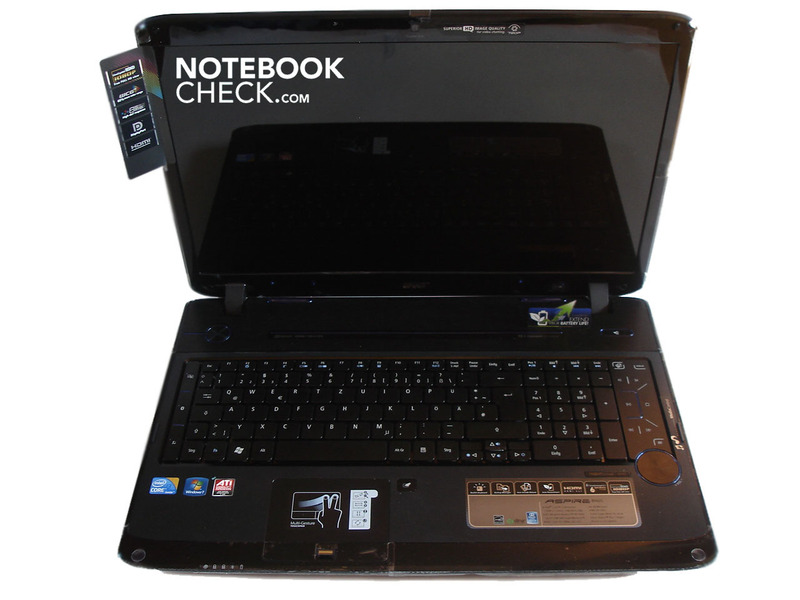 Basically, the Aspire 8942G is a notebook lacking outstanding strengths, but more important, also without striking weaknesses. You don't find that often and it makes the Aspire 8942G to a good all-rounder. 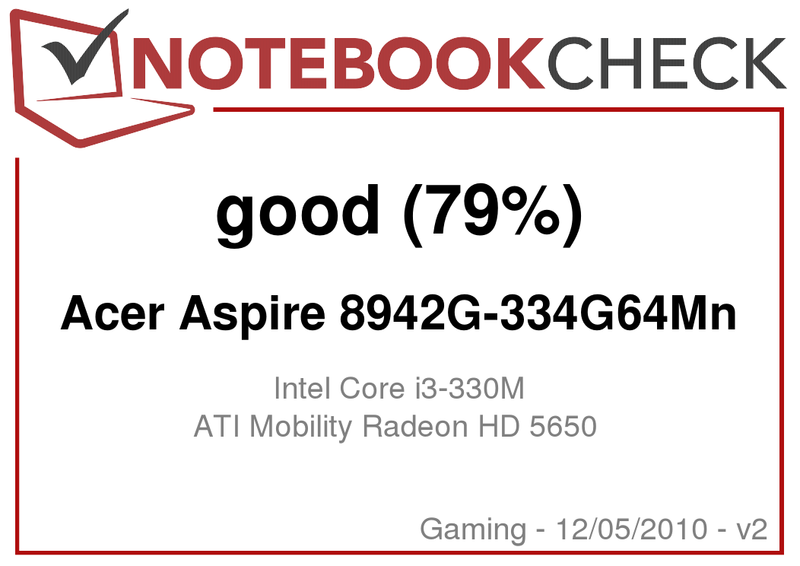 The fact that Acer has achieved making a few improvements in relation to the Aspire 8940G has to be positively mentioned. 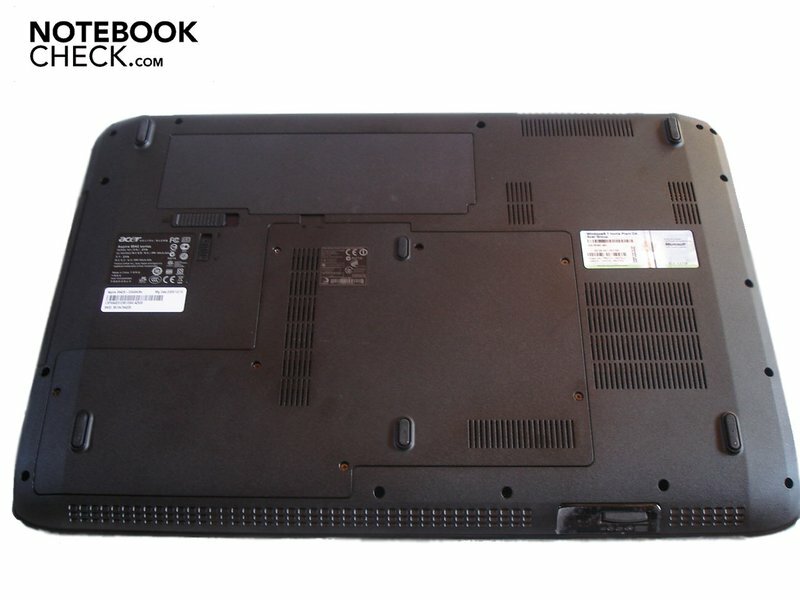 The workmanship and stability of the big 18.4 inch case is good, although the sensitive surfaces quickly smudge. The input devices also barely give reason for complaint. 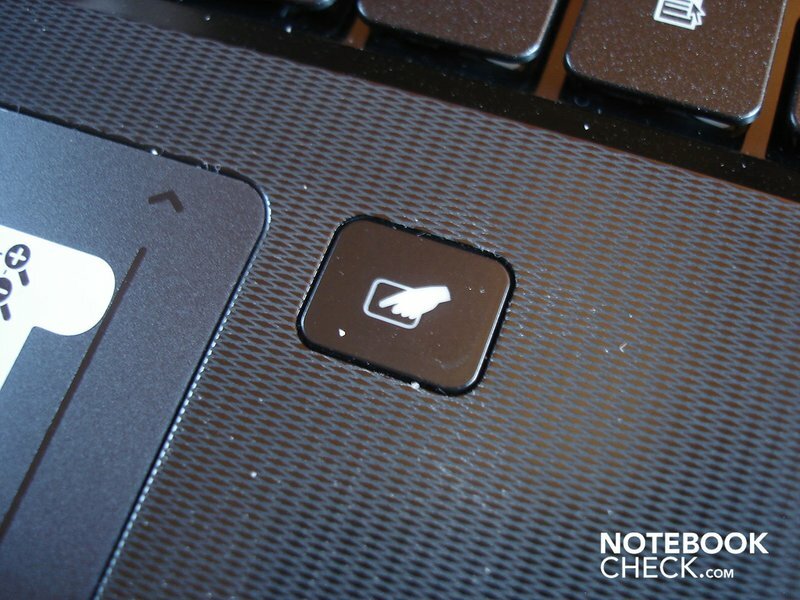 Especially the keyboard with its crisp pressure point and the discreet white light is pleasing. 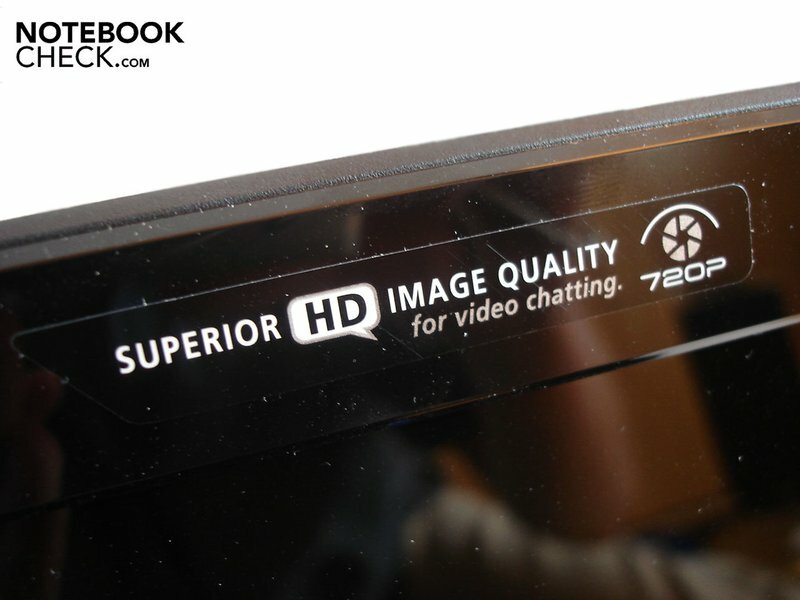 Above that, the practical and chic multimedia control and the circumferential connectivity is impressive (whereby we would recommend the merely 50 euro more expensive model with a better CPU, second hard disk and BluRay drive). The sound can also be categorized as over average. The relatively low temperature and noise development is also unusual. Battery life and display are alright, despite the limited vertical viewing angles and the partly hefty reflections. The given gaming performance is good in low resolutions. The built-in Radeon HD 5650 is often overburdened with demanding games in the native FullHD resolution of 1920x1080, which is why gamers should preferably turn to stronger graphic solutions like the GeForce GTX 260M or the Radeon HD 5850. If you're looking for a notebook without major weaknesses and with a comprehensive configuration for an attractive price, you'll hit the mark with the Aspire 8942G. 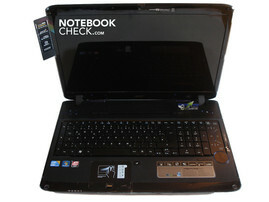 Many thanks to Notebook.de who kindly provided us with the test device. You can configure and purchase it here, as well. We found the striking volume dial well made. The very practical and unique multimedia control, as well as keyboard illumination. And the precise and crisp input devices, just like the immense amount of connections. 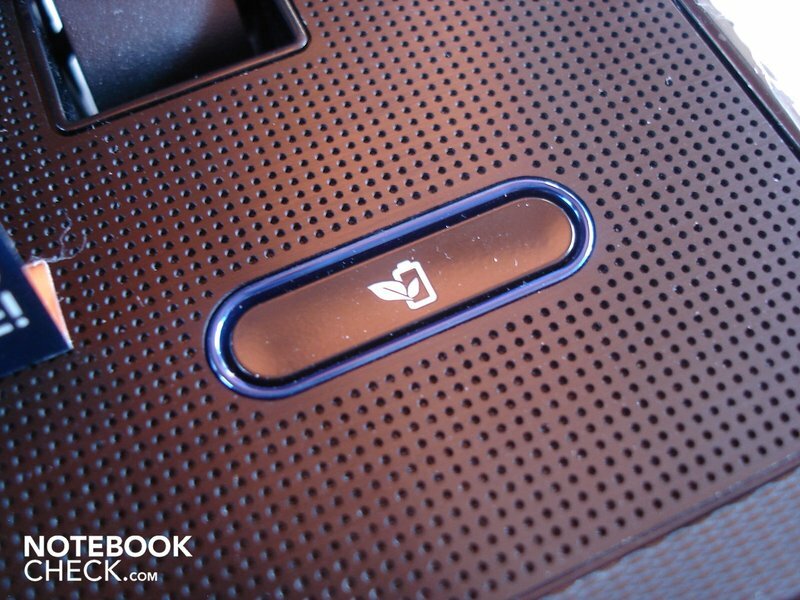 Above that, the sound of the built-in 5.1 system is better than that of the competitors. 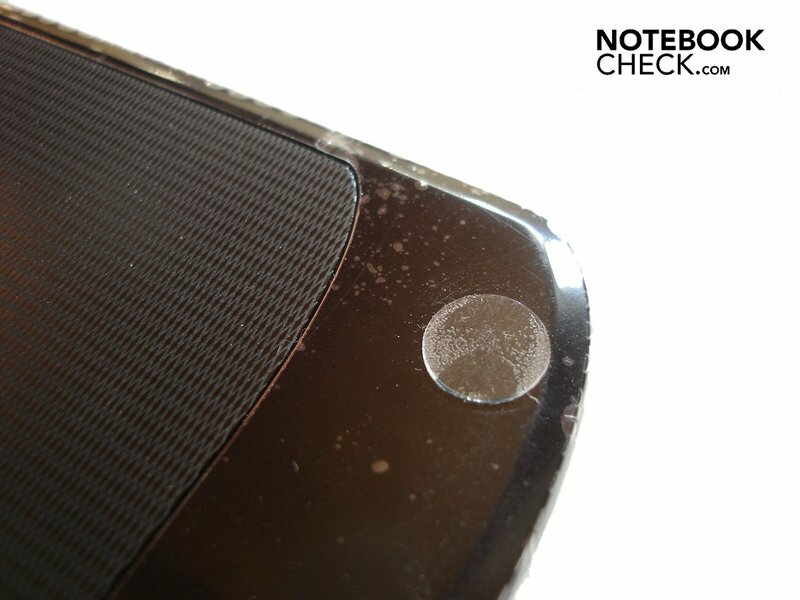 The case is extremely smudge-susceptible due to its high-gloss finish - you'll be perpetually cleaning it. Furthermore, the graphic card (Radeon HD 5650) is overburdened by demanding tracks in high or even medium details in the FullHD resolution of 1920x1080. 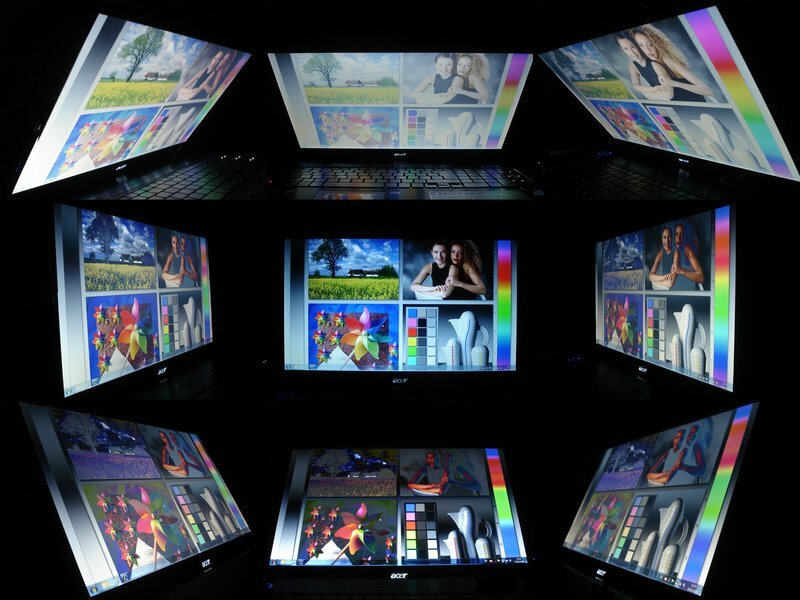 Conclusively, the display's viewing angles could be much greater. 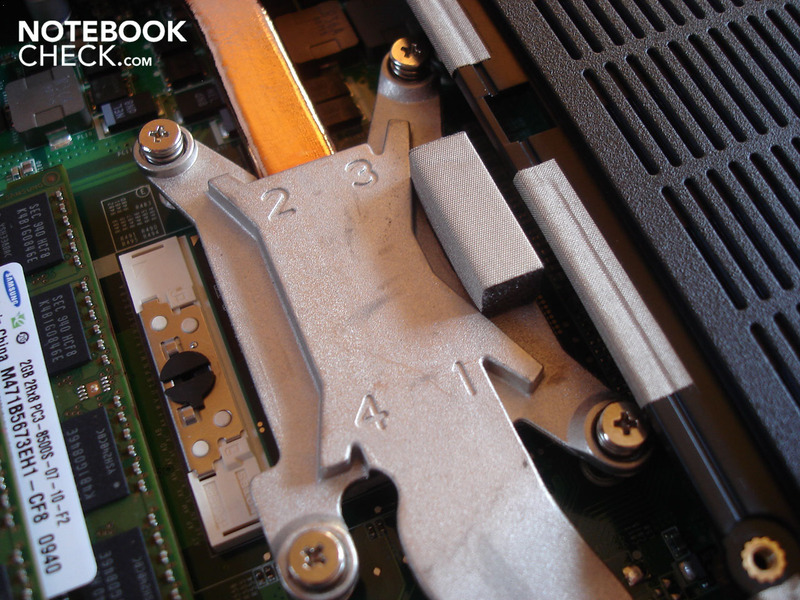 The notebook stays surprisingly quiet and cool even under load. Big and fairly efficient DTR/multimedia notebooks starting at 17 inches. Either in the range of less than 1000 euro, like Samsung's R780 i3 Harry / i5 Hero (GT 330M), R720-Aura P8700 Suga (HD 4650), Acer's Aspire 8935G (HD4670), Acer's Aspire 7740G (HD 5650), Packard Bell's LJ75 (HD 5650) or Asus' X77 (HD 5730). 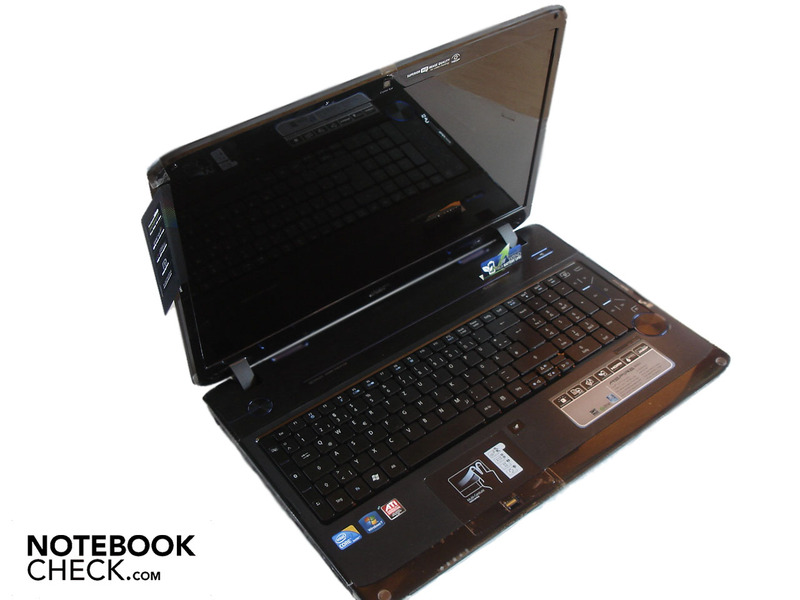 Or even faster, but much more expensive notebooks over 1000 euro, like Acer's Aspire 8940G (GTS 250M) or Toshiba's Qosmio X500 (GTS 250M).